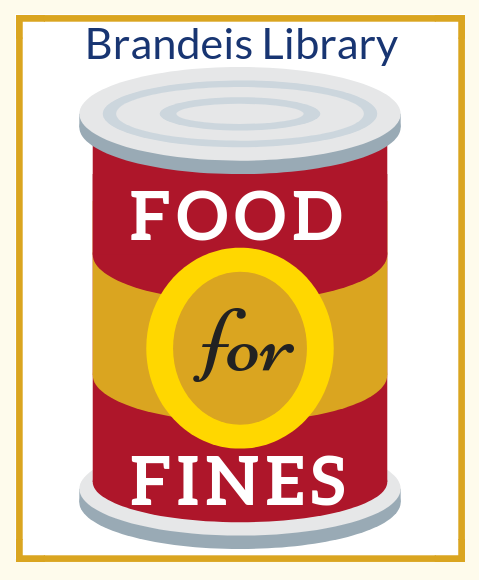 The Brandeis library is excited to announce our new Food for Fines program to support the Brandeis Food Pantry. Brandeis community members can now pay their overdue fines with a donation of non-perishable food or hygiene items. Each item donated is worth $5 towards library fines. Items must be non-perishable, in good condition, and not expired. Bring items to the Information & Borrowing Desk. (Graduate Student Center Conference Room - Kutz 102). Fines that have been billed to SAGE are not eligible. Replacement item fees are not eligible. For a full list of recommended items, visit the Graduate Student Affairs website.